Left: GMOS acquisition image of the binary system. The binary system is indicated by the green mark, where the third object (at a separation of 0.5 arcseconds) is well resolved. The Gemini spectra were carried out with a position angle of 90 degrees east of north, hence were resolve both the eclisping binary system and the third object into spectra. Right: GMOS spectra. The top panel shows the eclipsing binary spectrum (upper) and the third light object spectrum (lower). The primay (P) and secondary (S) component of the eclipsing binary system are indicated by the green label. The bottom panel shows the relative flux (in ADU) of the Hα emission line from the primary and secondary component of the ecliping binary system. Credit: Lee at al., 2017. "In this work we present a double-lined, M dwarf eclipsing binary discovered from cross matching Catalina Sky Surveys and Sloan Digital Sky Survey. The physical properties of this system are further characterized using Gemini telescope," the astronomers wrote in the paper. According to the study, SDSSJ1156-0207 is a very faint, double-lined M-dwarf eclipsing binary system with a very short period of approximately 0.3 days. Its primary component is about half the size and mass of our sun – with about 0.46 solar radii and 0.54 solar masses. The secondary star is approximately 30 percent the radius of the sun and has a mass of just 0.19 solar masses. Both stars are separated from each other by 0.0077 AU. The astronomers noted that the very short period indicates that SDSSJ1156-0207 is tidally locked and therefore its orbit is circularized. "We thus fix the eccentricity to be zero and only fit a non-eccentric orbit," the paper reads. Moreover, they assume that the secondary star is inflated. This could be also due to tidal locking, which enhances stellar activity and inhibits convection. Furthermore, the researchers estimated an effective temperature of the system. They reveal that the primary star has an effective temperature of 3,101 K, while the secondary component – 2,899 K.
In concluding remarks, the researchers underline the necessity of further observations of SDSSJ1156-0207, required to provide more detailed information about parameters of this system and to reveal more insights into the inflation mechanism in the secondary star. 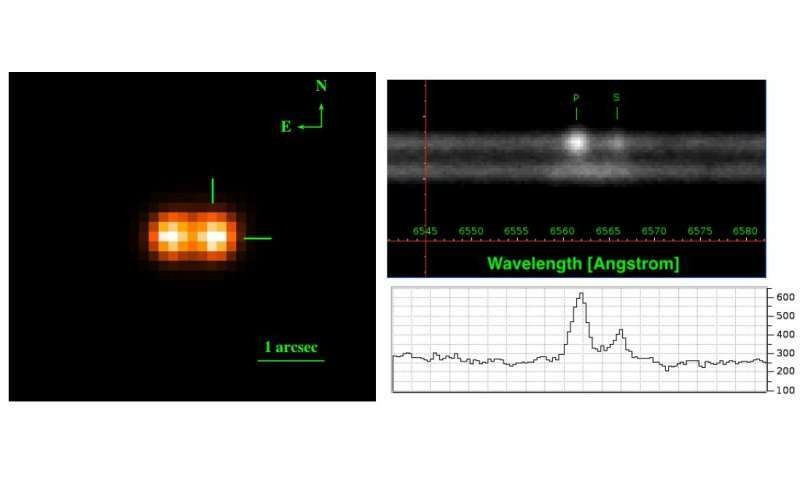 "High resolution spectroscopy in the future will help narrow down the basic properties of this system. Further Hα observations will shed light on the stellar activity, providing constraints on the inflation mechanism due to tidal-locking," the authors concluded. Eclipsing binaries are instrumental to our understanding of fundamental stellar parameters. With the arrival of ultra-wide cameras and large area photometric monitoring programs, numerous eclipsing binaries systems have been reported photometrically. However, due to the expensive efforts to follow up them spectroscopically, most of their basic properties remain unexplored. In this paper we exploited the eclipsing binary light curves delivered by the all-sky Catalina sky surveys, in tandem with the single shot spectroscopic survey from SDSS, and identify a double-lined M-dwarf eclipsing binary SDSSJ1156-0207. Because this system is very faint (V=15.89 mag), we obtained follow-up radial velocity measurements using Gemini Multi-Object Spectrograph onboard Gemini north telescope. This provides us a spectral resolution R~4000, enabling us to determine the mass and radius of each stellar components when jointly fitted with light curve. Our best-fit results indicate that both components are of M dwarf, with the primary component to be 0.54+/-0.20 M_sun and 0.46+/-0.08 R_sun, while the secondary component to be 0.19+/-0.08 M_sun and 0.30+/-0.08 R_sun. High resolution spectroscopic observations in the future will help pin down the stellar parameters, providing insights to the stellar models at low mass regimes, as well as shedding lights on the internal structure of close-in low mass objects and their inflation mechanism. Finding a short-period, eclipsing binary is the 'holy grail' of such astronomy, as so many variables are well-constrained. FWIW, can any-one find info on this system's approx. distance ?? @Nik, it doesn't appear they've estimated the distance to this binary pair. One could probably do a gross estimate based on observed magnitude vs. absolute magnitude, but that's not the most important thing about this particular pair. @Techno seems to have interpreted your question to be about the distance between the components, and if he is right and I am wrong, then his answer is correct as given in the paper. I think @Nik want to know the distance from us. Sadly, it does not appear in the paper. @Techno I'd essay a guess but there are complications introduced by imponderables in the ISM that I don't care to try to calculate. "... imponderables in the ISM..."
Ah, that distant. Fair enough !! Things should improve as pair's 'Proper Motion' take them clear of that 'Field Star'. OMG a M-dwarf eclipsing binary system!!! We will never be the same again! Should we pass out the razor blades and buckets? @Nik, actually the "field star" is giving hints at the composition of the ISM that may allow more precise calibration. The two celestial bodies can not rotate one around the other by circular paths, because then they would not have their spin.